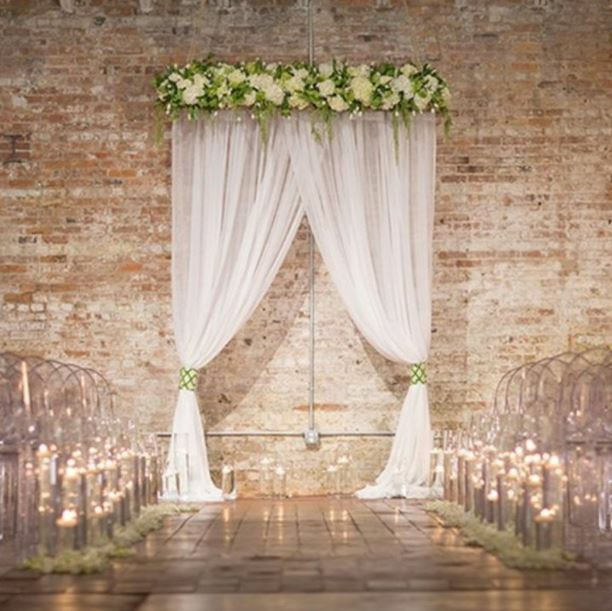 Chuppah Rental or Wedding Canopy Rental is a great way to decorate your ceremony space, and reuse for your reception as a canopy for sweetheart table or a backdrop for your bridal party table. Our Canopy/Chuppah is a modern pipe and drape system made out of steel so it can be used indoor, as well as, outdoor. We can decorate the Chuppah with crystal strands, floral designs, or artificial pomander balls depending on your budget. Silk Flower Option Available for Budget Friendly Brides. Prayer Cover available for religious ceremonies. Crystal Background Curtains are $50.00 each. * Prices do not include IL State Tax or Delivery, Setup, Room Flip & Breakdown. AGS Event Creations & VIP Events Decor specializes in wedding decorations, wedding centerpiece rentals, decor rentals, wedding flowers, Chuppah rentals, canopy rentals, manzanita tree rentals, candelabra, party rentals, chair cover rentals, luxury weddings, and floral designs for weddings and special events throughout the Chicago area, including Highland Park, Northbrook, Skokie, Glenview, Kenilworth, Glencoe, Riverwoods, Libertyville, Wilmette, Winnetka, Highland Park, Lake Forest, Buffalo Grove, Inverness, Barrington, Kildeer, Schaumburg, Rosemont, Arlington Heights, Oakbrook, Deer Park, Chicago, and surrounding areas. Call us today at (773) 865-6706 and let us know how we can help you have an incredibly beautiful, memorable and special event.